One of the things I say in the classic icebreaker 2 Truths and A Lie is “When I entered college, my goal was to have a career as an Air Force Security Forces Officer.” Coupled with whichever two life oddities I choose, I tend to draw some quizzical looks as people think about it. Now it’s your turn, dear reader: is this a truth or my lie? For any of you who said “lie”, I’m sorry to say that you are in fact wrong. Since I was 16, my heart and mind were both set on making it through ROTC and joining the military. My original degree was going to be in Criminal Justice with a second degree in History. Often, as a way to joke about the situation, I like to tell people that since we’re having a conversation about it and I’m not in a uniform, that didn’t end up happening. What I’ve never really gotten to do is reflect on how that’s gotten me here and into Student Affairs. Well for starters, I ended up leaving ROTC to become an RA. So the short answer is that I liked being an RA so much that I decided to pursue Student Affairs as a career. After 4 years of saying it that simply, I don’t think that’s enough of an explanation anymore. I’m someone who preaches telling our personal stories and believe that you can learn more about anybody by listening to parts of their life story than months of small talk interactions. This was my first major life crisis. I worked toward this ultimate goal of becoming an Air Force officer for 3 years, and one gut decision made it all crumble down in an instant. The effects rippled through my mind for over a year after and I was questioned numerous times as to whether I was truly happy being out of ROTC or just making excuses and was too afraid to admit I was wrong. It’s past time I explored this major life dilemma. I loved the military training environment as it taught me how to act under pressure and how to act confident even when I doubt myself. In the training environment, the people who question themselves get eaten up by screaming upperclass cadets looking to create teachable moments. These teachable moments look drastically different than the ones we promote in Student Affairs, but they’re teachable nonetheless and provide people with invaluable skills. I would need more than two hands to count all of the times this past month alone that I needed to make a snap decision and act confident about it. And that’s just one of the MANY life lessons. As an RA, I never knew what to expect when knocking on a door for being loud on a weekend, but if I gave whoever answered the door an inch, they might take a mile of my confidence. It may have been weird for people to witness, but staying monotone and stone-faced was actually a good calming mechanism in those situations. I planned to join the military to make a difference in the world. I could go anywhere and protect innocent people from terror or tyranny. For a very young adult, it’s an enchanting and romantic thought. However, I didn’t like the uncertainty that went into getting there. Would all the blood and sweat even be worth it in the end? Student Affairs is an uncertain field, but I see myself and my coworkers/mentors/classmates making a difference every day on a personal and individual level. Before anybody leaves my office in Salem, I ask them how they feel. Most times the answer is a long sigh and a smile or “Better!”. Those moments mean everything to me. To wrap up what can become a prolonged rambling, the biggest lesson that I’ve pulled in confronting that decision and living with it is that our struggles are worth it. I grappled with what the right decision was well into my junior year. What secured the decision then was when I got back into RA training and didn’t even consider that I would not be able to re-join ROTC in January 2015. I didn’t bat an eye, I just wanted to get back to my staff and residents. 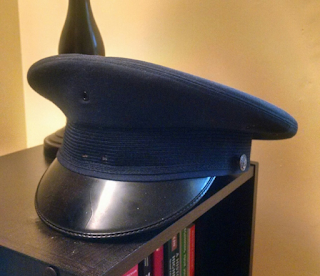 Since that point I’ve kept my old officer’s cap from high school with me no matter where I move to as a reminder of where this crazy journey all began. See the picture below. I wore this every Thursday during my senior year of high school. It’s remained one of my most prized possessions since then for its sentimental value and contribution to my life story. When I told my student staff this summer about my early career goals, one of them told me “I couldn’t see you in the military at all. You just don’t have the personality for it.” She’s right and it took me this long to realize that. I loved the training environment and have incredible respect for our armed forces, past and present, but I can see now with confidence why it was not for me. And I’m at peace with that. I don’t need to save the world, just help people find their place in it.